My stamps have been talking to me again as well. When I saw Wplus9’s Party Animal set with the sentiment “You always lift me up,” I knew one of the giraffes would be propping up the other! I wasn’t sure if it was going to be in a toybox or not – and ended up being outside on a big old rock! Watch the video below, or click HERE to check it out in HD on YouTube! To create the scene I used my MISTI, and finally filmed the round-robin process I’ve been working with on kits – if you have a MISTI, I hope it’s a helpful tip! Make one master scene on scratch paper – with approximate positioning. Don’t worry about overlapping images right now. Break the scene into a few groups – with the “front” objects in the earlier-stamping groups. Create masks for any of those front objects. Set up the first stamping in one quadrant. Another in the next quadrant. Turn the paper upside down and set up another, and a fourth if needed. When stamping, be sure to clean off the stamps from other quadrants really well so you don’t get accidental marks on the paper. I love to use an patrons! It really gets all the ink off well. Leave the quadrant assembly til you’re sure you don’t need to stamp more. My final little detail on this card was to add some Glossy Accents bubbles to draw attention to the sentiment! PS My patrons got to see a Zig Clean Color Marker version of this card last month! 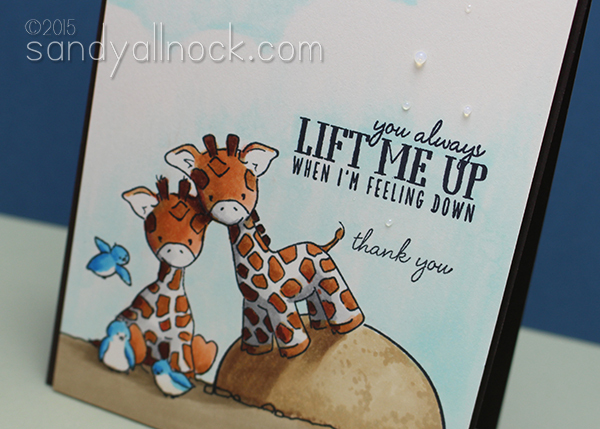 Hope you enjoyed my sweet little giraffes – and let me know if my other tips were helpful! Had to watch it again today! Thank you for all those tips and awesomeness! I keep checking your supplies list for the clear folding base with the ruler on the side. What is it and where did you get it?! Thanks! Love you videos! Love your videos sandy, they are all great and I look forward to seeing new ones. I have a question, do you allow others apart from those listed on your blog, to sell the hex chart, I’m wondering as I’ve seen it on a site. This is fantastic, thank you for all your tips and techniques! I just bought the Hex Chart and can’t wait to start using it. So cute! You mentioned your video on how to make the color wheel but no link was listed….Could you post a link to it please? Thank you. Love when others can lean on others since it maekes the world a better place. Thanks for this card reminding us to do that here and there. You are just amazing to watch and so wonderful to share so many tips and ideas. Thank you! WOWZER!!! This vid is loaded with tips! Thanks Sandy! I absolutely love the tip for the MISTI! Oh, and those giraffes? Don’t you just wanna squeeze them? Lol, I love this card. Thank you. Cuteness x 10! The giraffes have become my new must have. Beyond that I am blown away with the Misti tips you showed on this one. Hope I have the thought process to put together my own multiple stamping projects after seeing you nail this one! You are the bomb Sandy! Oh, Sandy, I learn something every time I view one of your videos!! Just love these adorable giraffes, and they are sweeter than sweet! Beautifully colored, and thanks for the new tips on the MISTI. I am loving mine more and more each day! Hugs! Beautiful card. I just love giraffes, and watching you color. Quick question, though.. When you color your hex chart, do you fully saturate the hexes, or just go over them once with color? (I hope that made sense) I have copics and spectrum noirs (Yes, copics are the fave) I noticed they both have their own little bar chart. If you read what they say.. Copics say use your chisel tip and go over the bar once to add your color. Where as, Spectrums say to fully saturate the bar. So, I am curious as to which you do for your chart. Do you want the fully saturated color to be on your chart for reference, or just the one pass of color? Thanks so much for your time, and for sharing your videos and techniques. I use the brush nib to make as few strokes as possible to fill it in. That’ll give me a “realistic” picture of what one layer of the color looks like in normal use. Love to watch you color. Thanks for the great tips. this is sooo cute! I must try it! Thanks Sandy. There are always so many wonderful tips in your videoes! I appreciate learning from you. So many tips in this one post/video. Great ideas and card! 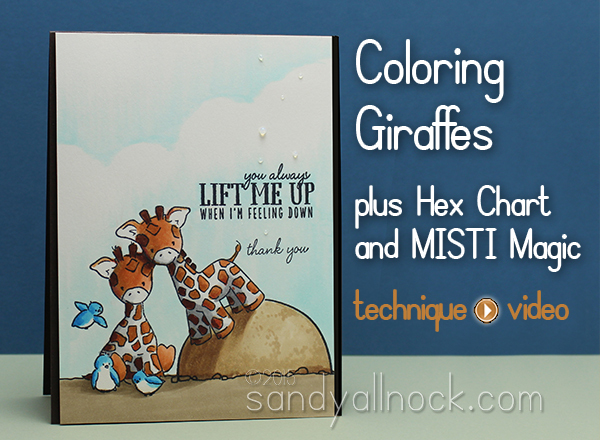 Love the giraffes…such a cute card…never thought about using the MISTI in quadrants…can hardly wait for the Zig version…adore the Hex chart…I am learning so much from your videos…love to watch!